Hey, I've released a new update, versioned 25.0 with some mind-blowing features. Already a Toggle Mod COMBO user? Then just open the application, you'll be greeted with an update notification. Or, just use the below link to grab it. Hope y'all doing good. After all researches and tests, our beloved Toggle Mod series got 3 more features, which you guys may not ever thought of. Support for the previous versions of Toggle Mod has been discontinued. So it's highly important to update with this app. Any complaints to prior versions of Toggle Mod would not be accepted. If you're installing a COMBO edition release over an old release, then you must un-install the previous application before updating. Respawn Time (From v5.0) - This was one of the most requested feature back then, but due to some technical problems and the limitation of knowledge at that time, I left it back in Development Mode. But today, it's no more a disabled feature. This feature has reborn with some specifics, like, now it's time range has increased to 30 seconds. That is, you could select from 1-30 seconds as your respawn time. Make sure to install the original Mini Militia game binary from the playstore. The game would certainly crash, if you try to patch over a modified game binary. 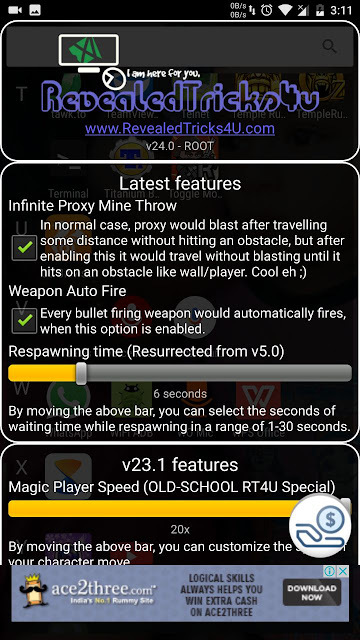 Toggle-Mod-COMBO-v24.2-RevealedTricks4U.com.apk (4.16 MB) - Click on Skip Ad after clicking this link, to get the download page. A small bug caused the app crash at start up. Nice Features! can u add an aimbot for mini militia? Kindly always be up-to-date, because each and every release may contain some feature, that needs a fresh install of the game and some bug fixes. Not so :D. It's all because of the comment moderation queue. If the patching takes longer than usual, then try changing your SELINUX status to PERMISSIVE. Unfortunately, being fair with the game developers. I've recently disabled that feature in my mods. So consider buying it off, it's just around a dollar. Nice work bro... But the mod is not working for me in marshmallow rom. Any solution?? Nice work bro... But the new mod is not working for me in marshmallow rom.... Any solution? hii sihab your mods are amazing and I daily check for update thanks for all mods. --------------------------------------------------------------------- I have some suggestions for you to add in upcoming mods. "WRITE IN YOUR MOD THAT THIS FEATURES ARE SUGGESTED BY ME-MALEK ABARAR". *if we trow bobm than we not lose one of the dual gun. *we can choose two weapon as a start weapon, like we can take ak47 with sniper as a start weapon. Can you add Google play services/games sign in option with your toggle modded apps? Hey Hey You r Back with Another great feature realy .. u r king of DA2 Mods now . ---with this option we able to play music in background in gameplay online or local . can you increase the health bar?? The same problem occurred to me.. Awesome features bro God bless you dude keep it up. I facing a problem buddy the game will freezing while playing in every gameplay modes except solo play survival.this makes me bored because every one freezes in game. I am an school student.Your toggle mod was very cool. Can you tell me sahihab? Wahts is an aimbot for Mini militia?? Please Fix This: The First Time i install toggle mod and i patch, it's good ; but when i patch second time it crashes everytime saying ' Unfortunately, Mini Millitia has stopped. Shihab this hack is nice but I can't use it. When I patch the game it says sucessful but when I try any modes of game, it redirects to my main screen after freezing for 2-3 seconds. Plz fix. Hello SIR ,You are rocking.
" Add one button besides the bomb button which is work as pause the game (like: magic pause;in the toggle mod put a bar for it,in this bar put seconds).but in this pause i am free to play and others are paused for some selected seconds. This is so amazing, SIR. How long does it take to patch modifications? Hi, from the previous and the latest mod, I am facing crashes in the game soon after the long countdown reaches zero. As soon as it hits zero, the game freezes and hence returns to the menu. we are glad you bringing us great mods of MM. recently you've released v25 which is freezing to much in both rooted and non rooted mobiles.